Along with average sizes, the stores on this list also carry a variety of tall women clothing. Some make it easy for you and offer a specific Tall section on their site. For others, the longer length sizes are mixed in with the other sizes. You'll have to do a little more searching at these retailers, but it's definitely worth it. Ann Taylor - $$ | 35" inseam | Sophisticated, classic style including a variety of professional and businesswear fashions. Long ladies jeans and pants in 35" inseams. Also has tops, dresses, skirts, suits, and jackets in longer proportions. Select Tall in the main menu for all tall clothing. Shop online or at retail locations. Banana Republic - $$ | 36" inseam | Fashionable, contemporary businesswear and apparel. Wide variety of long size jeans and pants in 36" inseams. 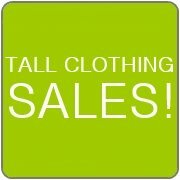 Also offers tall women clothing such as tops, dress shirts, sweaters, dresses, skirts, suits, and professional jackets. Select the Women's Tall category to view all tall clothing. Shop online or at retail locations. Cabela's - $ | up to 38" inseam | Casual, outdoor clothing. Long size jeans in 34" and 36" inseams. Select denim in up to 38" inseams. Also find outdoor and hiking pants in 34" inseams as well as a few styles with the option to hem up to a 35.5" inseam. Extended sizes available for tall women clothing. Shop online or at retail locations. Chico's - $$ | up to 35" inseam | Sophisticated, classic style. Tall size jeans in 35" inseams and pants in 34.5" inseams. Select Tall under the Inseam menu. Plus sizes available for tall women clothing. Shop online or at retail locations. Dorothy Perkins - $ | 36" inseam | Jeans, pants, and trousers in 91 cm inseams (approximately 36" inseams). Also offers tall women clothing such as tops, dresses, and maternity. See the Tall Clothing section. Shop online or at retail locations. Based in the U.K. Fashion Bug - $ | up to 34.5" inseam | Fashionable, classic-style clothing. Tall size jeans and pants in 34" and 34.5" inseams. Use their Right Fit sizing system to shop by body shape. Plus sizes available for tall women clothing. Shop online or at retail locations. Gap - $$ | up to 38" inseam | Fashionable, trendy apparel. Variety of long size jeans and pants in up to 37" inseams with select styles in 38" inseams. Also offers tall women clothing such as tops, tees, tanks, blouses, sweaters, dresses, skirts, coats, jackets, and maternity. Select the Women's Tall option to view all tall clothing. Shop online or at retail locations. J. Jill - $$ | up to 35.5" inseam | Sophisticated, casual style. Tall size jeans and pants in up to 35.5" inseams. Also has tops, sweaters, dresses, skirts, and jackets in tall sizes. Select the Tall option to view collection. Extended sizes available for tall women clothing. JCPenney - $ | up to 37.5" | Fashionable, classic-style clothing. Tall and ultra-tall size jeans and pants in up to 37.5" inseams. Also offers tops, sweaters, skirts, capris, suits, jackets, businesswear, activewear, sleepwear, swimwear, and maternity in tall sizes. Select the Talls option under Women's apparel to view collection. Extended sizes available for tall women clothing. Shop online or at retail locations. J.Crew - $$ | up to 36" inseam | Fashionable, contemporary apparel. Long length jeans and pants in 36" inseams with a select few in 35" inseams. Also offers tall women clothing such as tops, jackets, suits, sleepwear, and swimwear. Select the Tall option under Special Sizes in Women's apparel. Shop online or at retail locations. Jessica London - $$ | up to 35" inseam | Tall plus size clothing to size 28. Find plus size tall jeans and pants in up to 35" inseams. Also sells tall plus size tops, dresses, skirts, suits, jackets, and coats. Select the Talls category in the Clothing section. L.L.Bean - $ | Long inseams | Casual, relaxed clothing. Jeans and pants in tall sizes for women 5'9" and over (according to the size chart). Also sells long torso swimsuits. Extended sizes available for tall women clothing. Shop online or at retail locations. Land's End - $ | up to 36" inseam | Classic, casual style. Jeans and pants in up to 36" inseams. Free cuffing and hemming available on select items. Also offers tall ladies sizes in tops and swimwear. Select Tall option in Size Range drop-down menu in Women's section. Extended sizes available for tall women clothing. Also in the U.K.
Lane Bryant - $$ | up to 35.5" inseam | Tall plus size clothing to size 28. Plus size tall jeans and pants can be found in up to 35.5" inseams. Select Tall option in the Jeans and Pants categories. Lee Jeans - $ | 34" inseam | Offers a classic, casual style of women's jeans and pants in tall sizes with 34" inseams. Plus sizes available for tall women clothing. Levi's - $ | 34" inseam | Offers a trendy style of women's jeans in long sizes with 34" inseams. Choose your size in the Filter By Size drop-down menu. Extended waist sizes available. Lucky Brand - $$ | up to 36" inseam | Offers a stylish collection of premium women's long and extra-long denim in 34" and 36" inseams. Choose your inseam in the drop-down menu in the Women's Jeans section. Lucy - $$ | up to 36" inseam | Athletic clothing for the active woman. Tall ladies active pants in 34" to 36" inseams, including training and yoga pants. See Pants in Lengths section in the Bottoms category. Lulu's - $$ | up to 35" inseam | Juniors trendy apparel. Offers extra long jeans and pants in up to 35" inseams from emerging new designers. To find longer lengths, search for '34" inseam' or '35" inseam' in the search box on the site. Macy's - $$ | 34" inseam | Fashionable, contemporary apparel. Long jeans in 34" inseams. Select your size in the Women's Jeans section. Shop online or at retail locations. Metrostyle - $ | up to 35" inseam | Fashionable, trendy apparel. Tall jeans and pants in up to 35" inseams. Also offers tall women clothing such as tops, dresses, suits, jackets, and activewear. Select the Tall option under the Petite & Tall section. Extended sizes available for tall women clothing. My Tights - $ | Long Inseam | Carries tall and extra tall classic and fashion hosiery for women up to 6'5", according to the size guide. Based in the U.K.
New Look - $ | 35" inseam | Long jeans and pants in 35" inseams. Also offers women's tall clothing such as tops, dresses, skirts, and jackets. Select Tall under the Women's section. Shop online or at retail locations. Based in the U.K.
New York & Company - $$ | Up to 35.5" inseam | Fashionable, contemporary apparel. Long length ladies jeans and pants in up to 35.5" inseams. Also offers jackets, businesswear, and activewear in longer proportions. See the Tall category for the entire collection. Shop online or at retail locations. Next - $ | 35" inseam | Tall size jeans, pants, and trousers in 35" inseams. Also carries tall tops, dress shirts, sweaters, dresses, skirts, jackets, businesswear, activewear, and sleepwear. Select Tall under the Women's section. Based in the U.K.
Nordstrom - $$$$ | up to 36" inseam | Fashionable, contemporary apparel. Designer jeans and pants in up to 36" inseams. To find long lengths, search for your inseam in the search box on the site (ex. '35 inseam'). Shop online or at retail locations. Old Navy - $ | up to 36" inseam | Casual apparel targeting the younger crowd. Jeans and pants in long (34" inseam) and tall (36" inseam). Shop by inseam. Also has inexpensive tops, tees, tanks, dresses, skirts, shorts, jackets, activewear, and maternity in tall sizes. Extended sizes available for tall women clothing. Shop online or at retail locations. One Stop Plus - $ | up to 35" inseam | Tall plus size clothing to size 44. Find plus size tall jeans and pants in up to 35" inseams. Boot-cut, flared, and skinny jeans styles. Also sells tops, dresses, suits, jackets, coats, and activewear in longer proportions. See the Tall Plus category in the Clothing section. PZI Jeans - $$ | up to 38" inseam | Offers a stylish collection of jeans and pants designed specifically for the curvy woman in 34" (regular), 36" (long), and 38" (extra-long) inseams. Select your length under the Jeans/Bottoms category. Use the size chart to determine correct fit. Roaman's - $ | up to 36" inseam | Tall plus size clothing to size 44. Find plus size tall jeans and pants in up to 36" inseams. Also sells tall suits and tops in long lengths. Select the Talls category in the Clothing section. Sheplers - $ | up to 38" inseam | Women's western wear. Find tall ladies jeans in 34", 36", and 38" inseams. Select the Long Inseam Jeans option under the Shop by Fit section of Women's Jeans. Shop online or at retail locations. Skinny Jeans - $$$$ | up to 37" inseam | Offers a unique style of ladies skinny jeans meant to have a super-slimming effect on the legs. Choose from 35" and 37" inseams. Designs come in a range of denim washes and colors. Soft Surroundings - $$ | up to 36" inseam | Comfortable, casual clothing. Tall size ladies jeans and pants in up to 36" inseams. Also offers tall women clothing such as tops, dresses, skirts, sleepwear, and robes. For each clothing category, select Tall in the Narrow By Size drop-down menu. Extended sizes available for tall women clothing. Soft Surroundings Outlet - $ | up to 36" inseam | Comfortable, casual clothing. Discounted pricing on clothing from Soft Surroundings (see above). Limited sizes available. For each clothing category, select Tall in the Narrow By Size drop-down menu. Extended sizes available for tall women clothing. SVOBODA - $$$ | 36" inseam | Tall plus size clothing to size 28. Offers a stylish collection of premium women's plus size tall jeans in 36" inseams. The line is designed specifically for curvy and plus size women. Talbots - $$ | 35" inseam | Sophisticated, classic style. Long jeans and pants in 35" inseams. Select Long/Tall Lengths option in the Denim or Pants category in Apparel. Extended sizes available for tall women clothing. The Limited - $$ | 35" inseam | Fashionable, contemporary apparel. Ladies long jeans and pants with inseams of 35". Select Long in the Length drop-down menu in the Denim or Pants category. Shop online or at retail locations. Top Shop - $$ | up to 36" inseam | Trendy collections. Long length jeans in 36" inseams. Trousers and leggings in 35" inseams. Also carries women's tall clothing such as tops, dresses, skirts, and jackets. See the Tall section. Shop online or at retail locations. Based in the U.K. Torrid - $$ | up to 36" inseam | Tall plus size clothing to size 28. Find plus size tall jeans and pants in 34" and 36" inseams. Boot-cut, flared, and plus size skinny jeans styles. See product titles for length in the Denim or Pants sections. Woman Within - $ | up to 35" inseam | Tall plus size clothing to size 44. Find plus size tall jeans and pants in up to 35" inseams. Also sells tops and suits in tall plus sizes. Select the Talls Plus option in the Petites/Talls category.